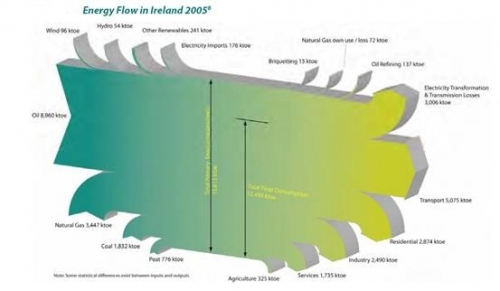 Another runner-up in my private “Fancy Sankey Diagram” contest definitely is this Sankey diagram shown on a webpage of the Longford Environmental Alliance (LEA) from Ireland. It visualizes the “Energy Balance for 2005 as a flow diagram showing our inputs from the left hand side and our outputs or usages on the right hand side.” It is a 3-D image, and kind of floats above the ground, although it doesn’t have a fancy shadow effect as this one does. I have shown similar diagrams for California, Japan, Sri Lanka, Scotland and the U.S. before. In these national energy balances the various energy sources are shown as entries from the left, while consuming sectors (or the “sinks”) are displayed as output arrows. This Irish Sankey diagram distinguishes ‘Agriculture’ as a separate sector. They didn’t publish the energy flow Sankey in the Energy In Ireland 1990-2006 (2007 report). But how in sam hall did they make this ? E-sankey doesn’t seem to do 3-d, I suspect that a graphic artist was behind it all. @Colm: Thanks for pointing me to the updated version of this diagram. Here is the post.